APA Style is a writing style and format for academic documents such as scholarly journal articles and books. It is commonly used for citing sources within the field of behavioral and social sciences. It is described in the style guide of the American Psychological Association (APA), which is titled the Publication Manual of the American Psychological Association. The guidelines were developed to aid reading comprehension in the social and behavioral sciences, for clarity of communication, and for "word choice that best reduces bias in language". APA Style is widely used, either entirely or with modifications, by hundreds of other scientific journals (including medical and other public health journals), in many textbooks, and in academia (for papers written in classes). Along with AMA style and CSE style, it is one of the major styles for such work. The APA got involved in journal publishing in 1923. In 1929, an APA committee had a seven-page writer's guide published in the Psychological Bulletin. In 1944, a 32-page guide appeared as an article in the same journal. 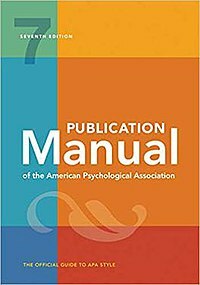 The first edition of the APA Publication Manual was published in 1952 as a 61-page supplement to the Psychological Bulletin, marking the beginning of a recognized "APA style." In response to the growing complexities of scientific reporting, subsequent editions were released in 1974, 1983, 1994, 2001, and 2009. Primarily known for the simplicity of its reference citation style, the Manual also established standards for language use that had far-reaching effects. Particularly influential were the "Guidelines for Nonsexist Language in APA Journals," first published as a modification to the 1974 edition, which provided practical alternatives to "sexist" language then in common usage. The guidelines for reducing bias in language have been updated over the years and presently provide practical guidance for writing about race, ethnicity, age, gender, sexual orientation, and disability status (APA, 2009, pp. 70–77; see also APA, 2009b). The sixth edition of the Publication Manual of the American Psychological Association is the most current. It was released in July 2009 after four years of development. The Publication Manual Revision Task Force of the American Psychological Association established parameters for the revision based on published critique; user comments; commissioned reviews; and input from psychologists, nurses, librarians, business leaders, publishing professionals, and APA governance groups (APA, 2007a, 2007b). To accomplish these revisions, the Task Force appointed working groups of four to nine members in seven areas: bias-free language, ethics, graphics, Journal Article Reporting Standards, references, statistics, and writing style (APA, 2009, pp. XVII–XVIII). The APA explained the issuing of a new edition only eight years after the fifth edition by pointing to the increased use of online source or online access to academic journals (6th edition, p. XV). The sixth edition is accompanied by a style website, apastyle.org as well as the APA Style Blog, which answers many common questions from users. Sample papers in the first printing of the sixth edition contained errors. APA staff posted all of the corrections online for free in a single document on October 1, 2009, and shortly thereafter alerted users to the existence of the corrections in an APA blog entry. These errors attracted significant attention from the scholarly community and nearly two weeks later, on October 13, 2009, the article "Correcting a Style Guide" was published in the online newspaper Inside Higher Ed that included interviews with several individuals, one of whom described the errors as "egregious". All copies of the printing with errors were soon after recalled in 2009 (including those from major retailers such as Amazon.com) and all manuals currently in circulation are unaffected. APA style is complex. Only a sample of citation and reference formats can be listed here. APA style uses an author-date reference citation system in the text with an accompanying reference list. That means that to cite any reference in a paper, the writer should cite the author and year of the work, either by putting both in parentheses separated by a comma (parenthetical citation) or by putting the author in the narrative of the sentence and the year in parentheses (narrative citation). Example narrative citation: Schmidt and Oh (2016) described a fear among the public that the findings of science are not actually real. Example parenthetical citation: In our postfactual era, many members of the public fear that the findings of science are not real (Schmidt & Oh, 2016). In the APA reference list, the writer should provide the author, year, title, and source of the cited work in an alphabetical list of references. If a reference is not cited in the text, it should not be included in the reference list. The reference format varies slightly depending on the document type (e.g., journal article, edited book chapter, blog post), but broadly speaking always follows the same pattern of author, date, title, source. Whole book Author, A., & Author, B. (year). Title of book. DOI/URL/Publisher location: Publisher Name. Brown, B. (2010). The gifts of imperfection: Let go of who you think you're supposed to be and embrace who you are. Center City, MN: Hazelden. For book and book chapter references, only one "locator" (DOI, URL, or Publisher) should be provided. If a DOI is assigned to the work, give the DOI. If the item is available online but does not have a DOI, give the URL. Otherwise, give the publisher and publisher location. Note that the title of a work may be italic or not italic. If the work stands alone, italicize the title; if it is part of a greater whole, do not italicize the title. ^ The Publication Manual of the American Psychological Association (6th ed.). Washington, DC: American Psychological Association. 2010. ISBN 978-1-4338-0562-2. ^ "APA Style". Washington, DC: American Psychological Association. Retrieved October 27, 2011. ^ Bentley, M.; Peerenboom, C.A. ; Hodge, F.W. ; Passano, Edward B.; Warren, H.C.; Washburn, M.F (February 1929). "Instructions in regard to preparation of manuscript". Psychological Bulletin. 26 (2): 57–63. doi:10.1037/h0071487. ISSN 0033-2909. ^ "APA Style Blog: The Origins of APA Style". blog.apastyle.org. Retrieved 2016-12-14. ^ APA Publications and Communications Board Working Group on Journal Article Reporting Standards (December 2008). "Reporting Standards for Research in Psychology: Why Do We Need Them? What Might They Be?" (PDF). American Psychologist. 63 (9): 839–851. doi:10.1037/0003-066x.63.9.839. PMC 2957094. ^ APA Task Force on Issues of Sexual Bias in Graduate Education (June 1975). "Guidelines for nonsexist use of language". American Psychologist. Washington, DC: American Psychological Association. 32 (6): 487–494. doi:10.1037/h0076869. ISSN 0003-066X. OCLC 696450842. Retrieved October 27, 2011. ^ APA Publication Manual Task Force (June 1977). "Guidelines for nonsexist language in APA journals [Change Sheet 2]". American Psychologist. Washington, DC: American Psychological Association. 30 (6): 682–684. doi:10.1037/0003-066X.32.6.487. ISSN 0003-066X. OCLC 696450842. Retrieved October 27, 2011. ^ "Supplemental materials: Chapter 3: Writing Clearly and Concisely". Washington, DC: American Psychological Association. Retrieved October 27, 2011. ^ American Psychological Association (April 13–14, 2007). Meeting of the Council of Editors (Agenda book). Washington, D.C.: APA Archives. ^ American Psychological Association (May 18–20, 2007). Meeting of the Publications and Communications Board (Agenda book). Washington, D.C.: APA Archives. ^ APA Publications and Communications Board Working Group on Journal Article Reporting Standards (2008). "Reporting Standards for Research in Psychology: Why Do We Need Them? What Might They Be?" (PDF). American Psychologist. 63 (9): 839–851. doi:10.1037/0003-066x.63.9.839. PMC 2957094. ^ Skutley, Mary Lynn (October 8, 2009). "Note to APA Style Community: Sixth Edition Corrections". APA blog. ^ Epstein, Jennifer (October 13, 2009). Jaschik, Scott; Lederman, Doug (eds.). "Correcting a Style Guide". Inside Higher Ed. Washington, DC. Retrieved October 27, 2011. ^ Swidrak, Carolyn (27 August 2018). "APA - How to Cite Your Sources". Overview & Citation Guide Portal. Regis. Retrieved 6 October 2018. APA format is complex and takes time to learn. ^ Endnote X, Thomson, 2006, The APA style is a very complex style. The Publication Manual of the American Psychological Association (5th ed.). Washington, DC: American Psychological Association. 2001. ISBN 978-1-55798-791-4. APA Formatted Paper Template at Indian River State College's Library site. Interactive APA at Massey University's OWLL site. The American Psychological Association (APA) is the largest scientific and professional organization of psychologists in the United States, with around 118,000 members including scientists, educators, clinicians, consultants, and students. The APA has an annual budget of around $115m. There are 54 divisions of the APA—interest groups covering different subspecialties of psychology or topical areas. Lightner Witmer was an American psychologist. He introduced the term "clinical psychology" and is often credited with founding the field that it describes. Witmer created the world's first "psychological clinic" at the University of Pennsylvania in 1896, as well as the first journal of clinical psychology and the first clinical hospital school in 1907. Neal Elgar Miller was an American experimental psychologist. Described as an energetic man with a variety of interests, including physics, biology and writing, Miller entered the field of psychology to pursue these. With a background training in the sciences, he was inspired by professors and leading psychologists at the time to work on various areas in behavioral psychology and physiological psychology, specifically, relating visceral responses to behavior. Mahzarin Rustum Banaji FBA is an American psychologist at Harvard University, known for her work popularizing the concept of implicit bias in regards to race, gender, sexual orientation, and other factors. David Shakow (1901–1981) was an American psychologist. He is perhaps best known for his development of the Scientist-Practitioner Model of graduate training for clinical psychologists, adopted by the American Psychological Association in 1949. Irving Kirsch is Associate Director of the Program in Placebo Studies and a lecturer in medicine at the Harvard Medical School and Beth Israel Deaconess Medical Center. He is also professor emeritus of psychology at the Universities of Hull and Plymouth in the United Kingdom, and the University of Connecticut in the United States. Kirsch is noted for his research on placebo effects, antidepressants, expectancy, and hypnosis. He is the originator of response expectancy theory, and his analyses of clinical trials of antidepressants have influenced official treatment guidelines in the United Kingdom. He is the author of the 2009 book, The Emperor's New Drugs. Florence Harriet Levin Denmark is an American psychologist and a past president of the American Psychological Association (APA). She is a pioneering female psychologist who has influenced the psychological sciences through her scholarly and academic accomplishments in both psychology and feminist movements. She has contributed to psychology in several ways, specifically in the field of psychology of women and human rights, both nationally and internationally. Since childhood, Denmark was academically successful. She received her PhD in social psychology from the University of Pennsylvania. David H. Barlow is an American psychologist and Professor Emeritus of Psychology and Psychiatry at Boston University. He is board certified by the American Board of Professional Psychology (ABPP). Barlow is known for his research and publications on the etiology, nature, and treatment of anxiety disorders. The models and treatment methods that he developed for anxiety and related disorders are widely used in clinical training and practice. Barlow is one of the most frequently cited psychologists in the world.